I have had a bit of a hiatus from blogging over the past several months. Mainly because I have been ridiculously busy, but also because I felt that I didn’t have anything new to say – and I always vowed to blog from the heart and only post when I felt I had something worthwhile to share. In SEVEN SHORT DAYS, a picture book of mine that has been SEVEN LONG YEARS in the making will finally be released. Yes, you read that correctly. SEVEN. YEARS. I often talk about the three P’s of publishing: practice, perseverance and patience. This book has taken a lot of patience. In fact, it would be fair to say that this book has tested my patience on more than one occasion. That’s a very good question with a very long answer. But suffice to say that the book has had some obstacles along its path to publication – some rather dramatic eye-popping speed bumps and roadblocks and mountain passes to scale that have seen delay upon delay upon delay. The first draft was written on 18 September, 2011. My document folder shows 29 different drafts! The manuscript was accepted for publication on 22 December, 2014. Annie White was commissioned to illustrate it in December, 2016. The book will be released into the wild on 1 October, 2018. These stats don’t reveal the roadblocks, but they do reveal the degree of PATIENCE that is sometimes required in this business. When I started writing this story, I wanted to write a robust adventure story with a strong narrative arc and lots of page-turning excitement – something very different to my previous picture book stories. 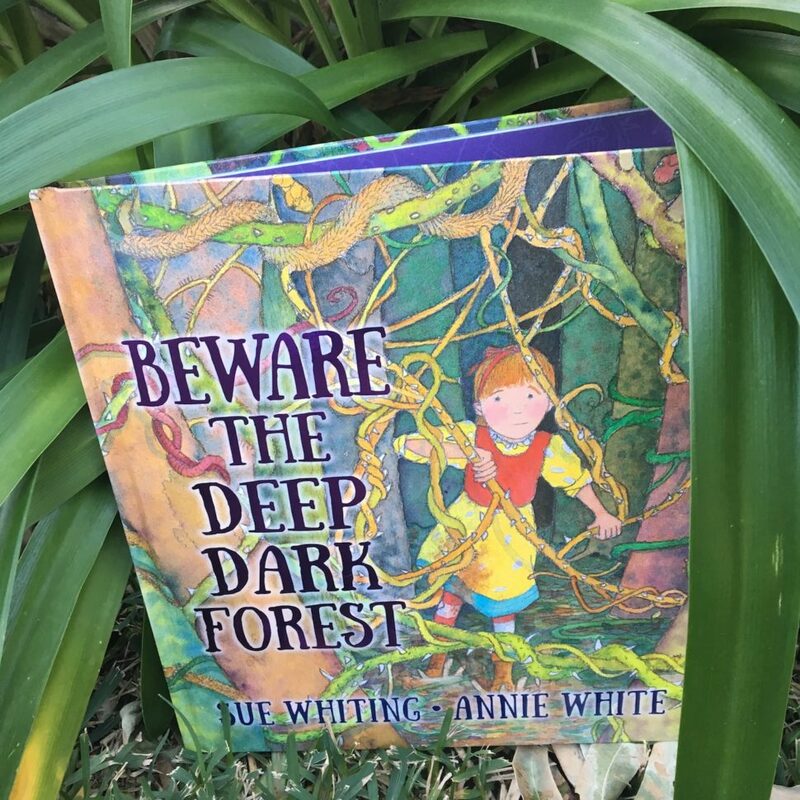 Beware the Deep Dark Forest is a hero’s journey story – a quest that sees young Rosie enter the deep dark forest to rescue her dog, Tinky. It has some cumulative elements, repetition, alliteration, much drama and a slightly humorous undercurrent. Ultimately, it is a story about courage written in the style of a traditional tale. The cover image gives you an indication of the gorgeous lushness of Annie White’s illustrations which have brought the story into vivid life in ways that are way beyond my imagination. Thank you Annie! And thank you too to Donna Rawlins for her editorial, design and art directing magic. Teachers’ notes can be found here. I will blog some more in the coming weeks about the process of writing this story, but now it is time for me to bite my nails and anxiously count down these last seven days until BEWARE THE DEEP DARK FOREST is finally released into the wild. I hope it has been worth the wait! Very exciting. Can’t wait to read it. And yes the illustrations look fabulous! The illustrations are gorgeous. Annie is so clever. Thanks Jackie. Congratulations on your new book baby. I can’t wait to see it. Thanks Jan – I do too! And the female lead was very deliberate. Why should the boys have all the fun? Hi Sue, I am just about to start a new job in our beautiful local bookshop and I will be helping out with the children’s books acquisitions so I will keep an eye out for your lovely new book! Can’t wait to see it and great to hear that the long process has finally come to fruition! Congratulations. By the way, we met at SCBWI Sydney a few years ago when you were with Walker. You were so encouraging about my work. I have my first book out now, called Somewhere a Bell is Ringing! Hello Barbara! I do remember meeting you – congrats on your book. That is awesome news. Congrats on the new job too. Working in a local bookshop is probably the best job for a book lover. Thanks so much for the support and for your kind words. All the best with your book (which I am about to google!). Congratulations Sue, I admire your patience. It encourages me to never give up. The book looks great and I can’t wait to be able to read it and share it with a classroom of kids. Thanks, Polly! That never giving up is almost a prerequisite in the world of publishing. Hope the classroom of kids enjoys it! All the best with your writing.